"Jenny" is the 9th song on American Music Club's second album, 1988’s California. Mark Eitzel recorded a live acoustic version for his 1991 Songs Of Love Live album, and a studio version re-made with Manolis Famellos and a group of Greek traditional musicians for 2003's The Ugly American. In 1989 Eitzel said "'Jenny' is a true story about somebody. She was at a party and everyone was wearing black and all these guys were picking up on her and necking, so she said 'Ok' and they were drunk and she was confused and by the end of the party.....I knew where she was coming from, but I wasn't anything to do with her. I was just going to write her song." In 1994 Eitzel told Melody Maker, "Kathleen was pretty pissed off about 'Kathleen' but Jenny loved 'Jenny'. But, after 'Kathleen', I learnt not to make it so obvious, like, uh, not naming the song after them or anything. That was a bit of a pointer." Mark Eitzel performing "Jenny" on January 19, 2007 at Union Hall in Brooklyn, NY, US. ↑ Nicholls, Phil (September 3, 1994). 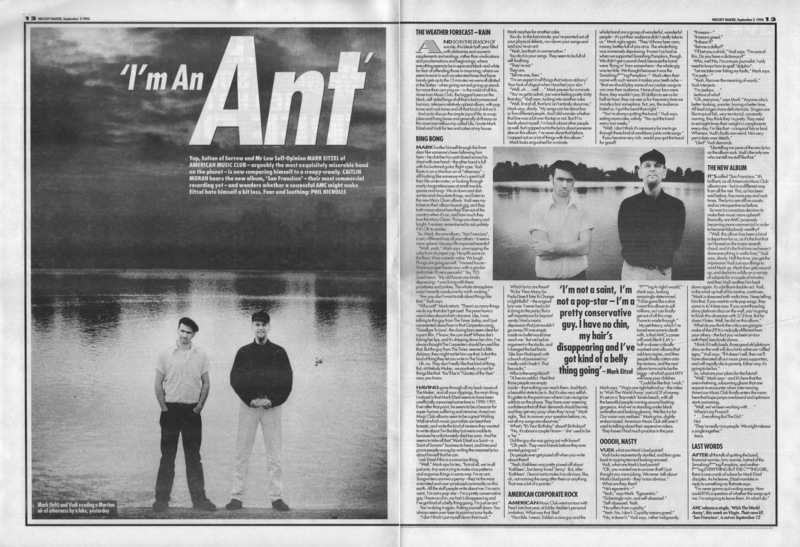 "I'm An Ant". Melody Maker. London: IPC Media. Retrieved January 16, 2018. This page was last edited on 27 March 2018, at 19:08.